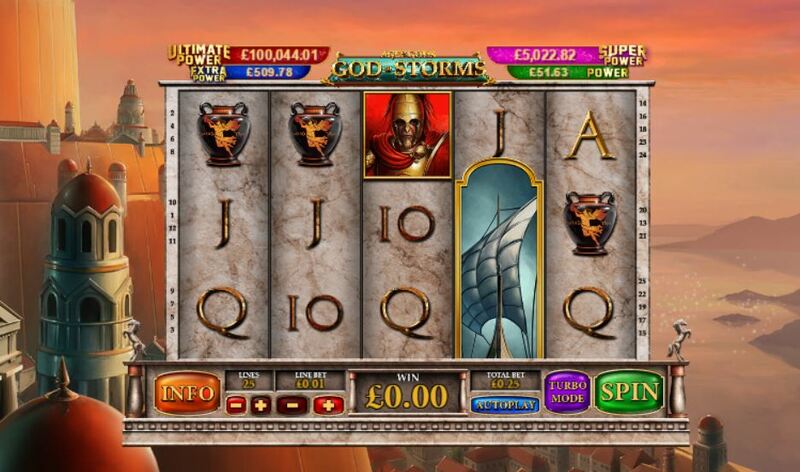 God of Storms slot has been added to the Playtech 'Age of The Gods' series which is the designated replacement for all their old Marvel-themed licensed games that were pulled in 2017. Playtech will have a job on their hands to match the reputation and sheer popularity of those defunct slots and although God of Storms displays one of those attractions in the form of the 4-Level Progressive Random Jackpots, it is hard to see how a God replaces a Marvel Hero. The winds will certainly have to be blowing in the right direction! We get 5 reels of 3 rows with 25 pay lines and they made from marble set against a backdrop of an ancient city-scape with pillars and towers. The sounds are simple snicks when the reels stop but we do get a blast of Romano-classical music if wins land or the in-play feature occurs. The Red Soldier offers is the best pay of 20x bet for a 5-of-a-kind combination followed by the female Warrior and the Archer at 10x with both the Serpent and vase awarding 6x bet for the 5. The card values pay 2 or 4x for the 5 which leaves us with the Wilds. There are two types of stacked Wilds both appearing on reels 2, 3 and 4. The standard one and the Ship Wild. The Ship Wild triggers the game's in-play and only feature when it lands fully in view on any of those 3 centre reels. When it appears, the God Of Storms appears to the right of the reels and blows the Wild along towards the left. So if it lands on reel 4, wins are paid then it is blown along to reel 3 for the next 'Wild Wind' re-spin. Wins are paid and then it is blown to reel 2 but this time a 2x multiplier applies to any wins. Then on to reel 1 and a 3x multiplier applies, then finally it has disappeared and a 5x multiplier applies to that re-spin. And that is all the Gods have for you here.